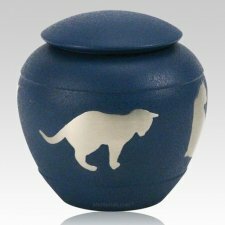 The Country Silhouette Cat Urn is crafted from finest brass and a wonderful final resting place for your loved cat. The bottom is lined with felt. "This is for my loved Kitty and I did not know that pet urns existed. I found Memorials.com Pet Memorials online and they had my urn to me within a few days. Thank you." Sam P.